Parts of Bellingham High School housed "The Great Unleashing" last weekend. Sponsored by a network called Transition Whatcom. Workshops, speakers, music and events revolving around how to live in a future with less fossil fuel. Bellingham High School reminded me of an arcology that day. Arcologies are "city in one building" structures. This could be a "mini arcology." I pictured that building full of apartments with the commons (pictured above) being an indoor "town square." What a concept in our rainy climate. It's normally just a school cafeteria, but a nice looking one with natural light. 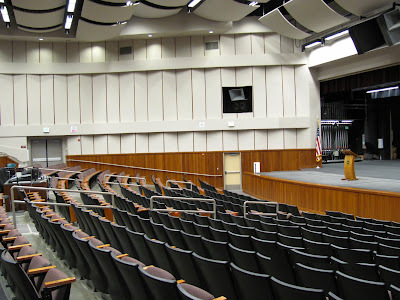 BHS was remodeled recently. Wouldn't it be neat to live in a place like that? I've often thought schools, malls and college campuses could make nice arcologies. My thinking is a different direction from many other folks in the transition movement who talk about people growing food and going closer to the land. Some folks have a rural vision, I have a more urban vision of the future. I ask, "can the farmland hold all the people?" Just one of many discussions that can get going. That weekend turned the school into a "virtual city of thinking people." I was ask to be on a panel for one of the many workshops. A discussion about "car-less in Bellingham and beyond?" I've never driven a car and survived so far. We met in the "Staff Room." Way back when I was in high school, wasn't the staff room where faculty snuck off to smoke? There were many other events including a few keynote speakers in the theater. Was a full house not that long before I took this picture. 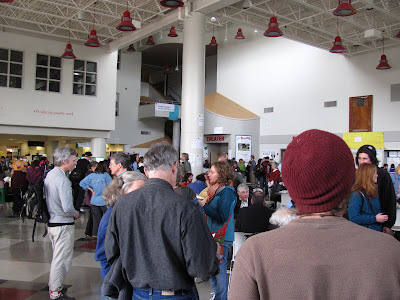 Several bands brought music to the cafeteria where folks mingled and impromptu conversations broke out. They say around 800 people attended Unleashing. Cafeteria was closed, but Food Not Bombs had their table set up near the "food service" sign. They were one of many participants in the Unleashing. 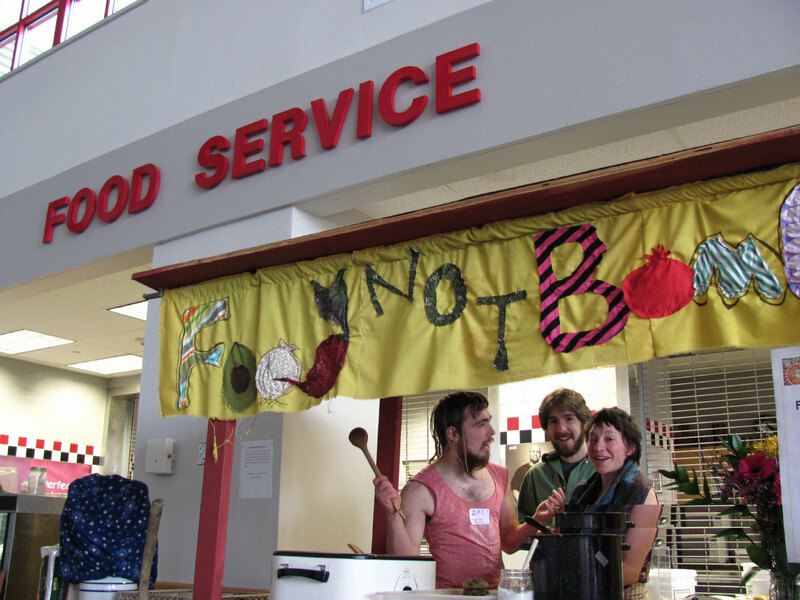 Each Friday, Food Not Bombs rolls this table to the corner of Cornwall and Magnolia streets where people gather around 4-5pm for the Bellingham Peace Vigil. That corner becomes another place for mingling and conversation. Transition Whatcom is quite successful in bridging on-line with face to face experience. It has an active social networking site, like a local Facebook, but also sposors events where people meet in person. Both the on-line and face to face experiences enhance one another.